Walk around any major city and you could be forgiven for thinking that sandwich shops are the growth industry of the 21st century. Takeaway lunch, it seems, is more popular than ever. The once-humble sandwich is now a much more cosmopolitan, eclectic affair. Years ago, chicken, ham or cheese was about as exciting as 'sarnies' got, while the bread was an uninspiring choice between white or brown, loaf or roll. But just as sandwich fillings have diversified - with chicken tikka or brie and grape now just as familiar as cheese and pickle - so too have the breads, from ciabatta to focaccia and bagel to rye. The opportunities for distinguishing your shop have also grown, given consumers' increasingly complex dietary requirements. There are now significant markets for, among others: vegetarians and vegans; Muslims, Jews and Hindus; people with gluten, dairy and other allergies; and those on various weight-loss regimes. The UK is increasingly health aware, so it's a good idea to offer low-fat meats, salads and vegetable fillings. By sourcing superior ingredients and making everything fresh you might be driving prices up, but many consumers prefer a freshly made sandwich over a date-stamped, vacuum-packed offering from a Tesco Express, newsagent or garage. For people in low-income areas, however, the price-quality equation is weighted differently, as nutritional concerns are eclipsed by financial ones. But just as rising disposable incomes and time constraints have made people more able and willing to buy instead of prepare their own lunch, globalisation and immigration have made people consider things other than sandwiches and pasties. Not so long ago, Thai curry was seen as an exotic and expensive food; to eat it for lunch would have seemed bizarre. Now office workers don't think twice about getting takeaway Thai at lunch or, for that matter, salad, pasta or sushi. The monopoly of the sandwich has gone, so it is more important than ever to create an interesting menu with a range of supplements. Think beyond crisps, soft drinks and chocolate bars. Many sandwich shops offer cappuccinos and lattes alongside cakes and other bakery goods to tempt in custom. In fact, coffee could be your primary focus like this entrepreneur, or you might decide you want to buy a bakery. As long as you and your staff have the culinary know-how, you could offer curries, pastas and salads alongside your sandwiches. It's advisable to refresh the menu every now and then, otherwise the regular customers - of which there should be many if you're near offices - will tire of your sandwiches and go elsewhere. Having quality suppliers will be valuable, particularly if you can obtain a diverse range of freshly baked speciality breads. Buy an existing business, or start new? Of course, if you buy a franchise, for example a Subway outlet, then you won't enjoy the freedom - or have the burden, depending on your point of view - of setting the menu and sourcing your ingredients. If you prefer the idea of a proven formula, national brand and marketing support then franchising is a viable alternative. Trade is concentrated mostly around the lunchtime period, although offering breakfast goods - croissants, bacon baps, coffees and so on - can add substantially to your base income. Trading late can also be of benefit if parts of your market are working unsociable hours, although it is rare to see a sandwich shop open past 3pm. And therein lies a big plus with this industry which isn't true of many: the hours are relatively short. Also, if you are in a business-orientated district, then it might not be worth opening at weekends, in which case you don't have to sacrifice your Saturdays and Sundays - unless, of course, you want to do catering. 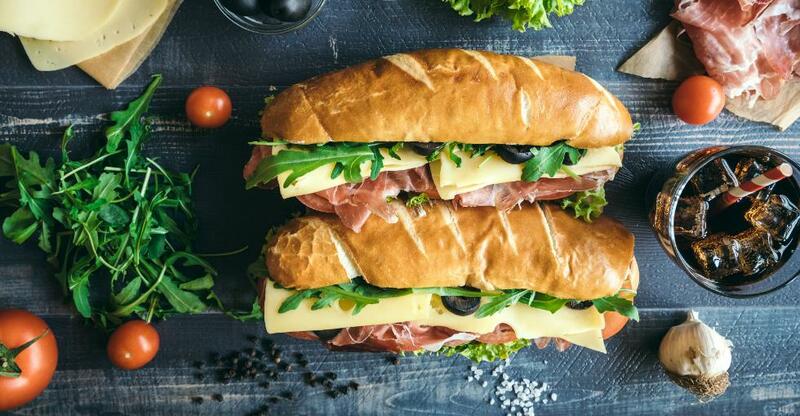 Catering is a key revenue stream for many sandwich shops, which can earn extra money at the weekend by laying on food for birthday parties, weddings and other functions. Sandwich entrepreneurs who want to keep their weekends free can still deliver platters to business meetings, exhibitions and other midweek events and gatherings. Seating can attract more customers, but you'll need larger premises and might have to compromise on display space. Beware of doing the latter, because so fierce is the competition that the visual aspect assumes a massive importance. Do not underestimate the difference mouth-watering products on display, as well as a prominent menu in a legible font, can make in luring customers in. Sandwich bars tend to be small units and start-up costs can be very low compared to many other sectors. But it's worth noting that the city centre locations which make large profits come at a premium. Other good locations for sandwich shops include business parks, student areas and spots with high foot traffic. As with bakeries, it is essential not just to be clean, but also to be seen to be clean. Food safety is a big issue and people are reassured if they see the sandwiches made in front of them in a faultlessly hygienic environment. Most importantly, and this might seem like a statement of the obvious, your sandwiches and other offerings have to be tasty and reasonably priced. Tourists might be ignorant of the quality of your food, but if your market consists predominantly of office workers, then repeat business and word of mouth are your lifeblood. If you start recognising a few faces among your customers, then it means you're doing something right. Give them further reason to keep on returning by serving with a smile and exchanging pleasantries. If you can establish yourself as one of the places to go for lunch, then this business can be profitable as well as creative. Jon is a freelance journalist and has done a substantial amount of work for Dynamis. Before going freelance he worked at Estates Gazette, and has written a number of articles for the Sunday Times, the Telegraph, the Independent on Sunday, Retail Week, The Grocer, Square Mile, and Regeneration.